Don’t Cross Him Off The List! The latest pulpy sci-fi yarn spun around the super-bad space-survivalist-antihero of the title opens on a bleak desert planet, an inhospitable place no reputable intergalactic travel agent could possibly recommend. “I don’t know how many times I’ve been crossed off the list and left for dead,” says Riddick (Vin Diesel) in a growly opening narration. Then he grabs a giant vulture by the neck and chokes it, sets his broken leg just in time to fend off a pack of marauding jackals, and gets the upper hand in an encounter with a carnivorous “mud demon,” a colossus that looks like a nasty mutation of a dinosaur, tadpole and scorpion. Riddick is marooned in this desolate, dangerous place, all alone, Robinson Crusoe-style. But as to whoever he thinks has been crossing him off the list—well, it certainly hasn’t been anyone making movies and videogames. Riddick follows two previous live-action films, Pitch Black (2000) and The Chronicles of Riddick (2004), plus an animated feature and two games. And Diesel has played the character in all of them. So there is a rather detailed mythology to Riddick, his tale, and how he ended up on this desert orb called Furya. You can go back and connect all the dots, if you’d like, but it’s unnecessary. (Why do his eyes glow? Not important—don’t worry about it.) This movie can stand pretty much on its own story-wise, and the franchise as a whole isn’t trying to be Star Trek, for goodness sake. The Riddick series isn’t a string of polished sci-fi pearls, by any stretch, but it does deliver pretty much what fans expect: slam-bang action, space creatures, decent effects, a good deal of dry, wry humor, and just enough R-rated skin, blood and language to appease grownup tastes. 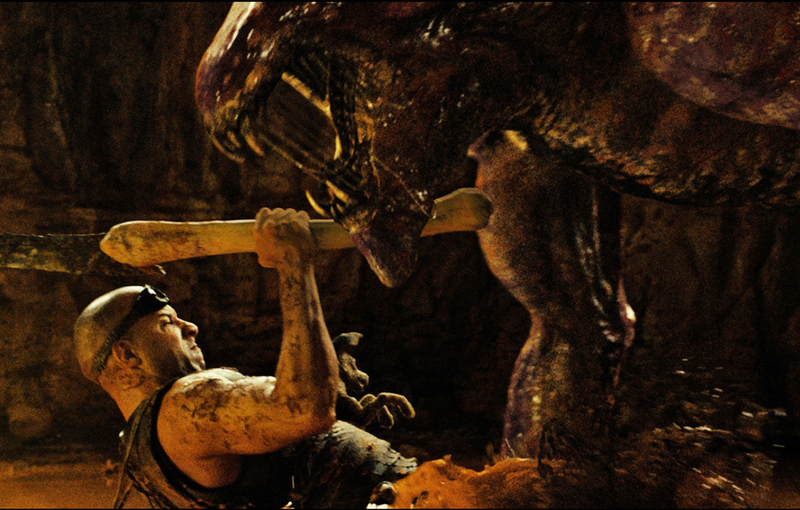 The plot of Riddick is simple enough, with overtones of a vintage Western transplanted a few centuries into the future and several light years out into distant space. When Riddick, a wanted man for murder, among other galactic misdeeds, triggers the signal beacon from an abandoned security outpost, it’s answered by two competing teams of bounty hunters anxious to haul him in. The mercenaries, expecting to make quick work of their task, are unprepared for their quarry’s lethal predatory skills—and for Riddick’s plan to shanghai one of their two ships to hightail it off his rock. There’s also the matter of that big, nasty-looking thunderstorm on the horizon, and the monstrous surprise Riddick knows it will unleash once the rain begins to hit the ground. Riddick may be a criminal in this Wild West, way-out “frontier,” but he’s the good guy by comparison—heck, he even raised one of the jackal pups to become his loyal “dog Friday.” There’s no question about who the audience is rooting for. 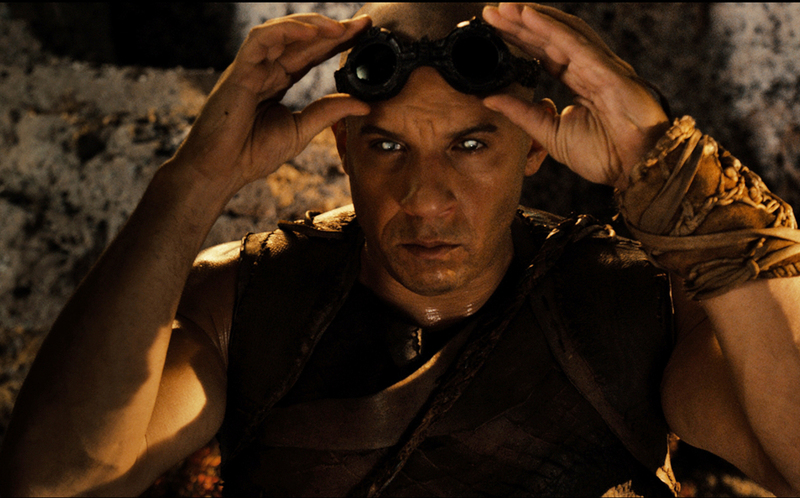 And there’s also little question, by the end of the movie, about whether or not you can expect to see Riddick again. If you haven’t learned already, you should know by now: This is one guy you should never cross off the list.